When most of us think about cranberries this time of year, cranberry sauce is probably what first comes to mind. While we love a good cranberry sauce on turkey (see our holiday menu as proof of that), there are so many other ways you can incorporate these tasty berries into your feast! Why include them on your menu at all? Well besides their great taste and festive color, they have a lot of health benefits. They are rich in antioxidants like other berries, but naturally lower in sugar than most fruit. About one cup has only 4 grams of sugar. Not bad! 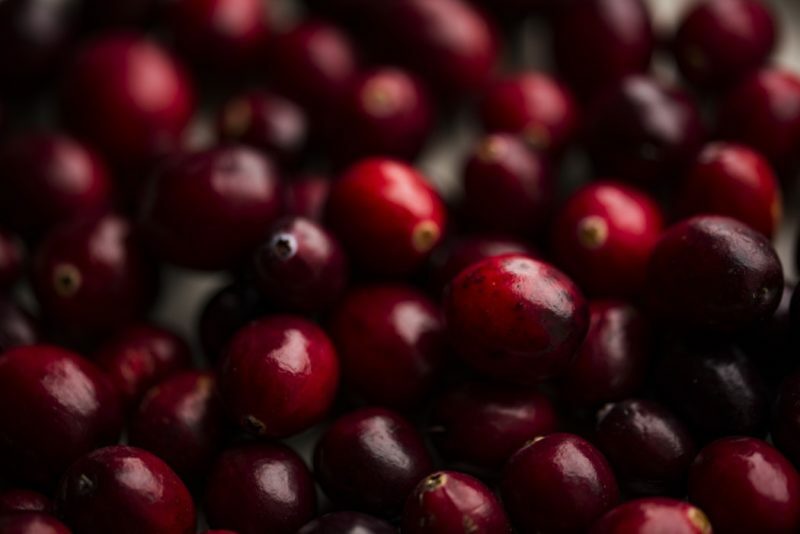 You’ve probably heard of cranberries helping reduce bacteria when dealing with UTIs (because of the antioxidant proanthocyanidins (PACs), but they also help boost your immune system during flu and cold season! They contain about 22 percent of your recommended daily dose of Vitamin C.
Did you know they are also good for your teeth? The PACs also help with keeping bacteria from sticking to your teeth and preventing gum disease. So if we haven’t convinced you that they should be on the menu already, hopefully these ideas will! Eating cranberries whole are obviously the best way to reap the health benefits, so go ahead and throw in whole, cooked berries into your stuffing! Pretty easy right? It not only sneaks in some nutrition, but it also adds a pretty color to your otherwise bland, brown stuffing. Here’s one of our cornbread stuffing recipe you can easily add cranberries to. Alright so they might not be good in pumpkin or pecan pie, but why not add them to your apple pie? The sweet cinnamon apples in apple pie are a great pairing with the more tart cranberry. Add Some To a Cheeseball or other Appetizer! We all get hungry as we’re waiting for the big feast to commence, so why not enjoy some cranberries beforehand? They would add some great texture and sweetness to the beloved cheeseball. Here’s a Cranberry Pecan Cheese Ball recipe if you’re up for making your own! If your Thanksgiving menu includes a salad, adding dried cranberries (try to find ones with little to no added sugar). It’s an easy way to add some sweet and color! Here’s an easy Green Salad with Cranberries, Apples and Pepitas recipe! If you’re serving up a vegetable dish like brussels sprouts (one of our favorite holiday side dishes! ), why not sprinkle it with dried cranberries to take things up a notch and really impress your guests? Here’s the Pioneer Woman’s Brussels Sprouts with Balsamic and Cranberry recipe. While the cranberries might not have much health benefit for you in a cocktail, adding some whole berries can make your holiday drinks look extra fancy! Don’t want to tackle Thanksgiving on your own this year? We offer personalized, fully-prepared Thanksgiving meals delivered right to you! We can take care of the appetizers to the desserts. The last day to book your Thanksgiving meal is November 19.